Half the battle of any health issue can be won if energy is channelled towards the right direction. "I believe" "I connect" "I am healing" are very strong affirmations. Here is a story I’d like to share with you. It was a Sunday morning and one of my PT participant, Mary (name changed), was waiting anxiously for my session as I had promised to teach her something new with Nature. But as always, I spend about 5 minutes to find out a little more about the week that went by basically to understand if the client was on track with her daily activities. And to that she said "not good"………. Mary is 70 years old and is a cancer survivor, to be precise skin cancer. She is now completely cured; however, she is always very careful when it comes to her health. She exercises regularly and eats right. She is also a care giver of her mother who is 96 years old and is suffering from Dementia. Though she has a resident help to take care of her mother's medical and physical needs, Mary is involved very much and most of the nights she doesn’t get sound sleep as they are all awoken when there is a situation with her mother. A few months ago, Mary found a growth under her eye lid which was operated. Luckily it was non-malignant, but her doctor told her to go back to the hospital if she spots anything in the operated area. ………. "The growth is back, I am very anxious.” said Mary. I could hear the stress in her voice and the fear in her mind. She did not realise that she was building all this in her mind based on the past experience until I pointed out to her that everything was fine and nothing has happened. The fact is that she discovered a growth and had to go to the Specialist to get a test done and based on the results the next step would be taken. I said this: "Mary, do you know where focus goes energy flows?”….. I asked her, "So Mary, where do you think your focus is and where do you think the energy is flowing towards now?” and she said "Fear”. "Now, Mary, observe how you are breathing right now”. She realised that she was not breathing fully, and this was an eye opener for her. Mary was able to realise that she had been so stressed the past couple of days, worrying instead of taking immediate action. Her mind was so nervous in the past few days that she was not in a state to make any decisions or take any action. The morning session turned out to be something out of this world for Mary. The intense worry and anxiousness were broken with a few positive intentions. Out of all the intentions, "I am Grateful” was so relevant at this point for Mary. She realised how blessed she was to be an independent, strong woman surrounded by her loving and supportive family and that thought brought a smile to her face. With a dash of fun and laughter, we were good to begin our routine. Together, we took a few deep breaths, breathing in love, gratitude, joy, strength. 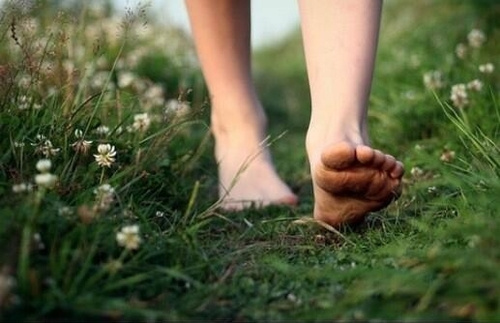 Then, with our bare feet, we stood on the lawn with our eyes closed and connected with Mother Earth to energise every cell in the body and the thoughts in the mind. With this inward connection, Mary was able to breathe deeper thus calming her mind. When her mind was calmer, she was able to share with me what actions she was willing to take to make things work for her. She has a much clearer and focused mind and she enjoyed the BreathWalk, using Nirvana® Cloud#7 App. By the end of the whole session her face just lit up, it was a state of peace in her heart and mind that was reflecting on her face. Mary is practicing BreathWalk with bare feet connecting with nature and she is taking one day at a time, giving focus towards her well-being. She is practicing deep breathing to de-clutter and heal her mind. With a little bit of re-assurance, empathy, love and compassion, our clients can go a long way. * Story written by our NEX Meera Nair from Singapore.